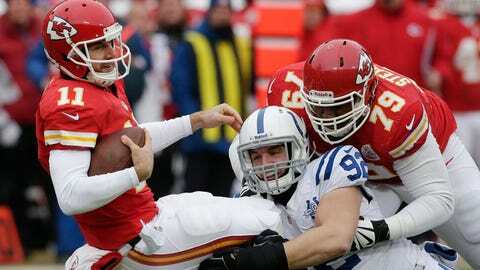 It was a long day for Chiefs tackle Donald Stephenson, and an even longer one for Chiefs quarterback Alex Smith. KANSAS CITY, Mo. — It wasn’t all bad, right? Why, Andy Reid is now seven out of eight in challenges this season — 7-for-8? That’s like a George Brett doubleheader! And did you know Jamaal Charles now has a dozen games with at least 100 yards from scrimmage and a touchdown? The NFL record is 13, set by then-Cowboy Emmitt Smith in 1995. And even though it probably felt like kicking concrete, given the temps, Dustin Colquitt punted the snot out of the ball again, same as always. Oh yeah, did we mention that we got a chance to see Overland Park native (and future Marvel Super-Hero) Paul Rudd in the home locker room after the contest? Ant-Man, people! The real-life Ant-Man! 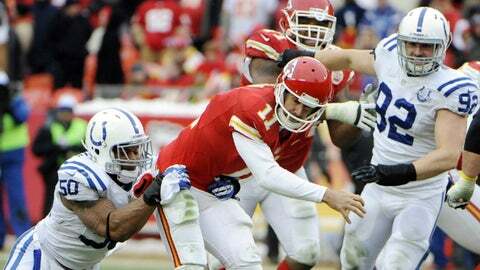 :03 … Another Monday morning MRI for Tamba Hali? Seriously? Well, as of early today, we’re not quite sure HOW serious things are. After the game Reid said only that the Chiefs’ veteran outside linebacker "has a sore knee; it was sore before the game and it swelled up on him a little bit … that’s why he came out of the game right at the end there." The 30-year-old pass-rush specialist was held out of practice in late November because of ankle problems suffered a month ago, but it wasn’t clear as of Sunday night whether the two were related in some way. Hali is second on the Chiefs in sacks (11.0) but, as with the rest of the Kansas City defense, his pace has slowed considerably since Halloween, racking up just two takedowns over his last eight games. :02 … Did you notice how many times Andrew Luck either rolled the pocket away from a Bob Sutton blitz or did just enough dancing to make time to find a hot read? We did. Least Shocking Stat of the Week: Before ace pass rusher Justin Houston went down with that (expletive deleted) elbow injury, the Chiefs gave up more than 17 points in a game once. From the Nov. 24 Chargers tilt on, they’ve surrendered 23 or more in four out of their last five. We’d love to stop pointing out this trend. Honest, we would. But it just keeps … trending. Still, as Reid pointed out after the contest, Sunday was a combined effort of bad, back to front. Dwayne Bowe’s inconsistencies have been well-documented (and dissected), but the coach insisted his mercurial wideout was playing hurt against Indy. Tackles Donald Stephenson and Eric Fisher had rough afternoons at the same time, which didn’t do much for Alex Smith’s decision-making — or his accuracy. Colts linebacker Robert Mathis beat Fisher around the edge early in the third quarter, reaching in and slapping Smith’s forearm as he threw, causing a wounded duck that left the quarterback’s grip like an infield fly. And this particular pop-up came down in the waiting arms of inside linebacker Jerrell Freeman, setting up a 51-yard touchdown run by Indy tailback Donald Brown. Get well, Branden Albert. Get well, quick. :01 … With the Chiefs’ playoff seed locked in (No. 5, highest of the two AFC wild cards), what do we have to play for? Ummmm … (makes pondering face) … pride? Ummmm … (more pondering face) … revenge for that 41-38 stunner at Arrowhead last month? Look, ya got us. The Andy Gang is stuck in the middle, but everything else in the AFC — literally, everything — is in mad-crazy flux. The Broncos (12-3), Patriots (11-4), Bengals (10-5) and Colts (10-5) are jockeying for seeding at the top; the Ravens (8-7), Steelers (7-8) and Dolphins (8-7) are fighting to nab the last seat on the Lamar Hunt Trophy Party Bus. Oh, yeah: So are the Chargers (8-7), who will roll into Qualcomm on Sunday against the Chiefs with both fists flying. "The Chargers won’t play like it’s an exhibition game," guard Geoff Schwartz said. "So I promise you, we’ll be ready to play." Ready, sure. Willing? We’ll see.